Singapore and Sri Lanka signed a free trade agreement on Tuesday (Jan 23) which will deepen economic ties and facilitates greater trade flows between the two countries. The Sri Lanka-Singapore Free Trade Agreement (SLSFTA) was signed by Singapore’s Minister for Trade and Industry (Industry) S Iswaran and Sri Lanka’s Minister for Development Strategies and International Trade Malik Samarawickrama. 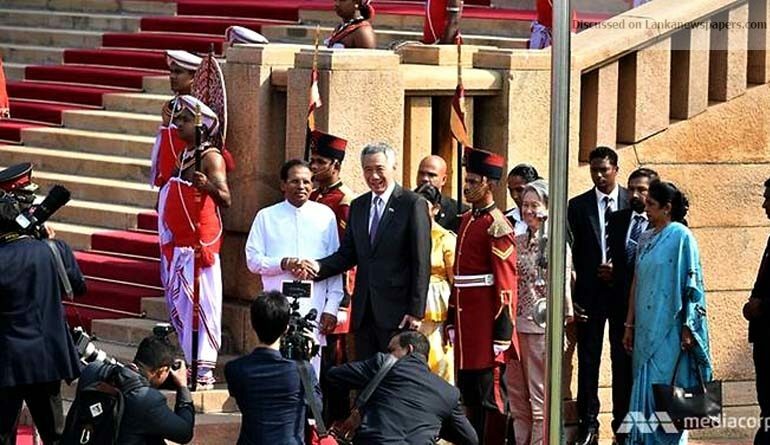 Prime Minister Lee Hsien Loong and Sri Lankan President Maithripala Sirisena witnessed the signing in Colombo. With the deal inked, Singapore and Sri Lanka companies will gain greater access to each other’s markets across many sectors, said Singapore’s Ministry of Trade and Industry (MTI) in a news release. Outlining the key benefits of the agreement, MTI said Sri Lanka will over 15 years, eliminate tariffs on 80 per cent of Singapore’s exports. This means a potential tariff savings of about S$10 million each year, it added. The ministry said the agreement also contains one of the most liberal rules of origin, which will allow more exports from Singapore to qualify for the lower tariffs negotiated. It includes Sri Lanka’s first treaty commitment on government procurement. This will allow Singapore companies to bid for projects by several of Sri Lanka’s large central entities and state-owned enterprises. Singapore and Sri Lanka are also committed to granting better access to each other’s services markets, said MTI, adding that the agreement includes sectors of interest to Singapore companies in the professional and trade-related services as well as environment, construction and tourism. The SLSFTA also covers cross-border transfers of information by electronic means and data flows. MTI said this will benefit Singapore and Sri Lanka companies given the increase in demand for e-commerce and digital services. There are also safeguards against discriminatory treatment based on nationality and protection against expropriation. Under the agreement, the Singapore International Arbitration Centre is listed as an institution where Investor-State disputes can be heard. MTI said this is aligned with the objective of promoting Singapore as an arbitration hub. 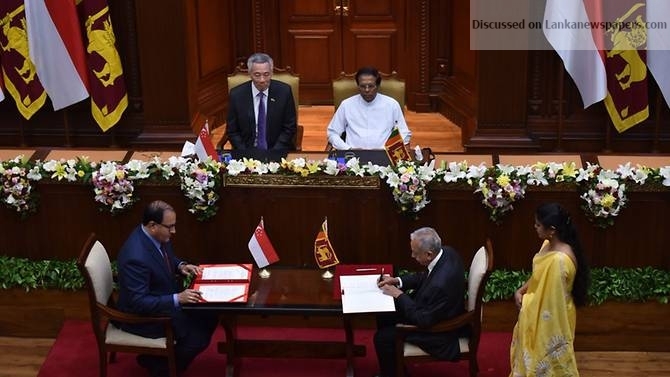 Prime Minister Lee Hsien Loong and President Maithripala Sirisena witness the signing of the free trade agreement. To date, Singapore companies have established a presence in Sri Lanka in sectors such as construction, infrastructure, manufacturing, food and services. There are currently about 90 Singapore companies in Sri Lanka. MTI said Sri Lanka was Singapore’s 36th largest trading partner in 2017, and bilateral trade amounted to S$2.7 billion. Singapore’s exports to Sri Lanka totalled S$2.5 billion, while Singapore’s imports from Sri Lanka totalled S$178 million. Singapore’s top exports to Sri Lanka include petroleum and diesel, non-monetary gold and jewellery, while top imports from Sri Lanka include motor spirit, fuel oils, perfumes, clothing accessories and wheat flour. Speaking to Channel NewsAsia about the agreement, Sri Lanka’s High Commissioner in Singapore Nimal Weeraratne noted that both governments had found that they could come up with a “modern, comprehensive and higher value free trade agreement” between both countries. “It will liberalise trade and service, it will improve investments into Sri Lanka, and it will give a shot in the arm to manufacturing and service,” he said. He added that the SLSFTA would “certainly be helpful” to small and medium enterprises and other prospective investors interested in Sri Lanka. The Trade with Singapore are largely the re-export of items imported from third countries. We hardly produce anything domestically. Will our import-export firms stand up to the competition from the Singapore firms.? Or will our foreign trade be entirely captured by Singapore firms? Hope our private sector can stand up to the competition?